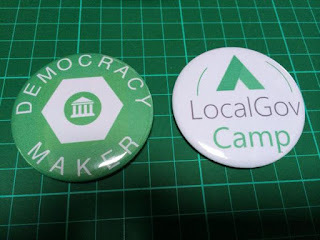 This is a very quick post following two exciting, creative and thought provoking events - LDMakers15 and Local Gov Camp. I'm sure there will be loads of post-event blogs which I urge you all to read. 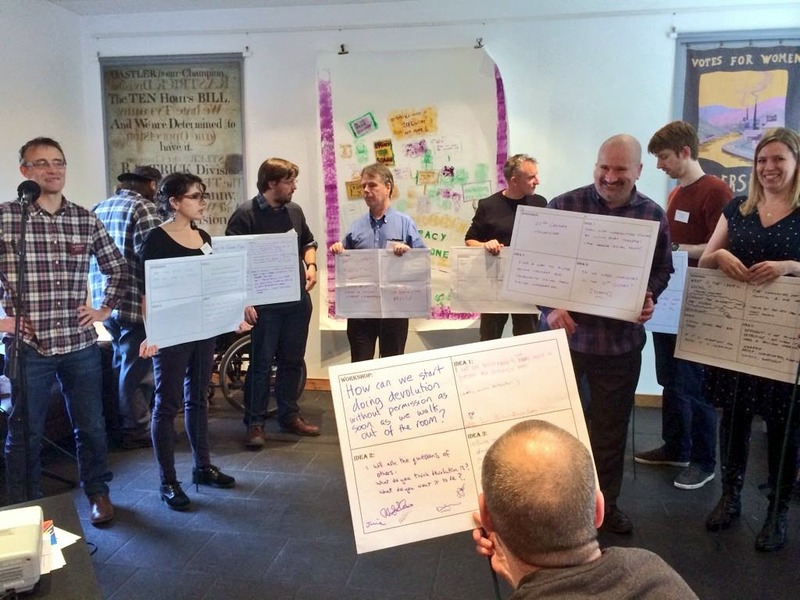 As I'm a bit lazy I'm going to point you to Phil Rumen's excellent blog post which sums a lot up for me and tells the story of the journey many of us have been on which resulted in the Makers session on the Friday. A special thank you to Phil for his efforts in pulling it off. Top man. Whilst I will commit to sharing the details of the stuff I was involved in over the two days, this post is just a general refection, obviously with a focus on local democracy. The most heartening outcome for me was that local democracy, both specifically and generally, seemed to be much more of a continuing feature over the two days. The fact that we were able to get democracy people, councillors, makers, activists and digital folk together for a full day to try and resolve our design challenges was something we could have only dreamt of 12 months ago. There is still much to do, but the fact that so many people selflessly gave up their time provides me with hope and confidence for the future. Thank you. My optimism increased further when I heard the pitches that were put forward on Saturday. Local democracy was front and centre with pitches on accessibility to voting, devolution, the challenges of participatory versus representative democracy and some dodgy session on redesigning local democracy. I look forward to reading and sharing the session write-ups. Having sometimes wondered if local democracy was getting lost or forgotten in the whole digital discussion I am feeling more positive. Perhaps it's not the Cinderella we thought it was Dave. It's always about what happens next so we'll try and keep the local democracy train rolling all the way to Notwestminster on 12 and 13 February. Do come and join us on that journey, I think it will be a good one. PS also massive thanks to Nick Hill (great to finally meet you), Diane Sims (digital artist and partner in crime), Catherine Howe (always good to catch up and be inspired), Sarah Lay (good to chat, about music as well as digital), Ed Hammond (enjoyed your session), Dave McKenna (wasn't the same without you) and the Notwestmister gang. I will post in more detail about yesterday's event when I have fully recovered and had a chance to reflect properly. This post is simply a big "Thank You." I have never been involved in planning an event on this scale before and therefore take my hat off to people who do this sort of thing for a living. I now realise that it is a big jigsaw, with many pieces. Those pieces only fall into place as a result of people who are willing, committed and selfless. So this post is in recognition of all those folks who contributed to #notwestminster. Thank you to.... our sponsors. Without them having the bravery to buy into a concept the event would not have got off the ground. Thank you to.... our supporters. In particular, my employer, Kirklees Council, Brent at the Media Centre for providing an outstanding venue and Huddersfleld University whose students gave up their time to help the planning and running of the day. Thank you to.... the team. All of the leg work was carried out by a few selfless folks who did the majority of the work in their own time because they believe in local democracy. How great is that? So thanks to David, Spencer, Andrea, Aggie, Jane, Andrew and a special shout out to Diane Sims who is truly a digital artist. Thank you to ... our participants who pitched their ideas and backed it up with their valuable time on a Saturday. I was truly gob smacked at the incredible depth of experts who signed up without hesitation. Thank you to.... my LocalGov Digital colleagues without whom there would have been none of this. Sarah Jennings and Liz Copeland deserve special mention as do Carl Haggerty, Phil Rumens and Sarah Lay. Their support, advice and encouragement have been invaluable. And finally, thank you to.... everyone who came, contributed and committed to keep the conversation going. At a time when there seems to be an obsession about the price of local democracy it is reassuring to be reminded that there are many people who value local democracy and are prepared do something about making it work better. 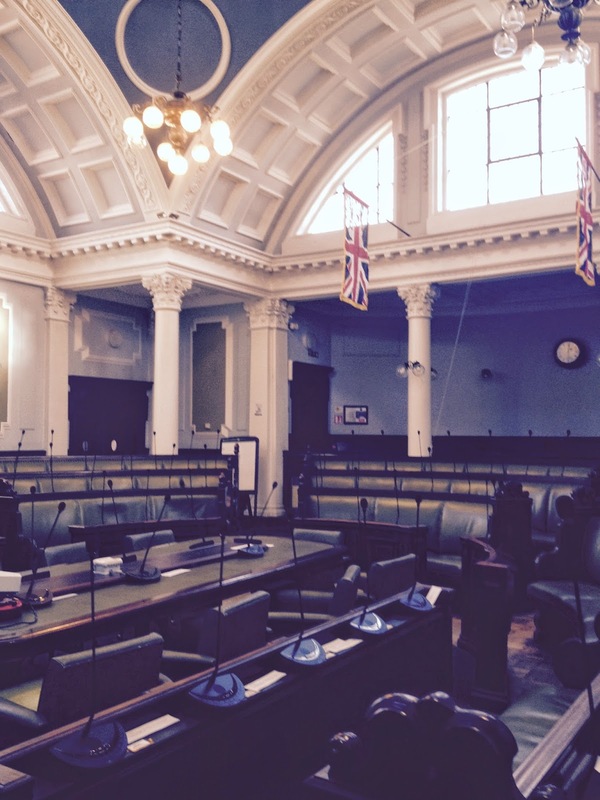 This week I was lucky enough to be invited to speak to all of the councillors on North Yorkshire Council about the possibilities that digital presents in terms of their varying roles. Firstly, what a beautiful part of the country, what a magnificent building County Hall is (I'm a civic building nerd) and what lovely hospitality - thank you. I think it is ok to say that one of the main reasons I was there was to provide a bit of challenge and explore the art of the possible. Of all of the councillors there only one is a social media user. It was nice to catch up with @torycannonfoder as he was present back in the day when we did our regional cllrsocmed sessions. He's still flying the flag. It's not easy being a councillor - difficult decisions to take, changing and increasing expectations against a backdrop of diminishing resources. AND all of this in a digital age. Would you want the job? But does digital provide opportunities? Opportunities to Communicate ..... about whats happening in your patch. @JayneCowan is brilliant at this. Opportunities to Engage ..... with resident and communities about local issues and concerns. Cllr Nicola Turner uses Facebook effectively in this way. Opportunities to Broadcast ..... Councillor Phil Murphy, Monmouthshire, using You Tube as part of the council's budget consultation. Opportunities to Watch ..... you don't have to take part. Put your ward into the Twitter search engine and see what's going on. Opportunities to Campaign ..... whilst it might be no substitute for good old fashioned shoe leather there is evidence from the Obama campaign that social media can have a positive impact as part of the campaigning process. Opportunities to Mobilise ..... there are now many examples of the value of social media in supporting mobilisation in terms of crisis and emergency. As community leaders councillors are often in the frontline when supporting residents in such situations. Opportunities to be Transparent ..... most councils are now web casting or live streaming their meetings. Why not use parts of that content to communicate and share with your residents? I tried to make the point that these are all tools that can be added to the elected representatives tool box (thanks to Dan Slee for the tool box image on Creative Commons). They are tools that may help them do what they do already. They are not a panacea nor are they a substitute for tried and tested methods (door knocking, leaflets, poster, meetings). As is traditional closed with the issues that usually come up - connectivity, your kit, pressures on time, managing on-line reputation. I was the slot before lunch so that, in a nutshell, was it. I'm not sure what effect any of this will have had. Let's see. Please feel free to comment on this post and share. Given that we are in the midst of World Cup frenzy it seems fitting that our Digital Tips for Councillors has turned out to be a game of two halves. 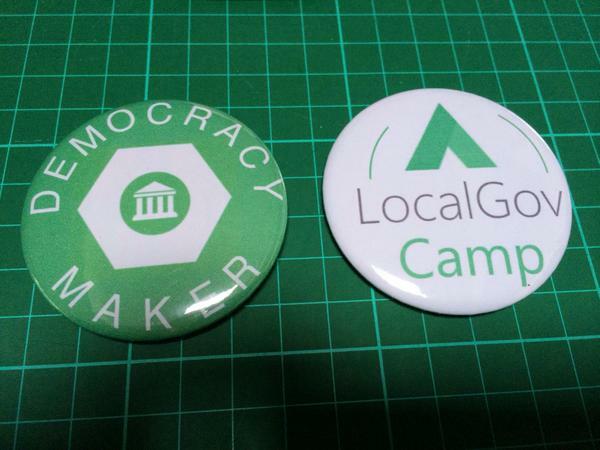 Our first instalment was a product of our session at LocalGov Camp. Dave McKenna (@Localopolis) has blogged about it here, taking us from 1 to 11. 13. Invite citizen tweeters in - Twitter can be a great tool for quickly getting service user perspectives which can be used as part of your councillor role. We heard a great case study from a councillor who was en route to a meeting with the local bus company who used twitter to ask what issues to raise. Responses were used as part of the meeting. Powerful stuff. 14. Remember it's a slow burner - setting up a social media account is not just a case of "build it and they will come". It will take time to build up interest and followers - "be patient, post regularly but don't be obsessive" were the key messages. 15. Tweets alone won't win elections - digital campaigning is another tool in the politicians box but will not be enough on it's own. As one councillor said, "there is no substitute for shoe leather" but there are real opportunities to blend on-line with off-line. Put your Twitter account on your election leaflets. 16. 10 Tweets don't make a policy - the consensus was that, for councillors, policy making is a serious and multi-faceted process. Whilst digital can play a positive part in that process (Neighbourhood Plans were used an example) it should not be the main driver. Be careful of the vocal digital minority. 17. Make digital a part of induction - is your council allowing you to dip your digital toe as part of new councillor induction? If not, find out why. Officers have a part to play in supporting councillors use digital although the consensus was that social media savvy councillors are better placed to support their peers. Councillor-led / Officer-facilitated seems to be the best mix. 18. Ignore the trolls - all of the councillors involved in our session had their own personal troll story. They accepted that this is an unfortunate part of being in public office. Their advice - ignore them. 19. Manage your own account - we heard "unbelievable" tales of corporate social media accounts being managed by councils on behalf of councillors. Broadcasting corporate messages. Surely not. Be authentic and manage your own accounts. It's really easy to tell when you don't. 20. Develop a relationship with the local press - it's increasingly likely that your local press will have a social media account. Follow them and encourage them to follow you - column inches will be yours. @CllrKevin provided us with a nice case study explaining how the Doncaster Free Press now report on his work in their Twitter Round Up. 21. Think about Standards - all councillors sign up to the National Code of Conduct. Remember that this applies to your digital world - if you wouldn't do it in a public meeting, don't do it on line. Don't Tweet in haste - "you get very little time to repent at your leisure". 22. Content is King - this links to Tip 4. Whether you choose to share content purely in your role as a councillor or mix it with some personal insights, make it interesting and engaging. Constant broadcasting is a bit of a turn off. Obvious, but true. 23. Digital is more than Twitter - both of our sessions focussed a lot on Twitter (it's how the conversation went) but there are a whole range of tools out there. Take some time to find out what you want to achieve and which tool(s) best suit you. 24. Don't be a D**k - in the spirit of honest reporting Tip 24 had to be included. I don't think this is specifically covered in the National Code of Conduct but the councillors present all agreed that when using digital this is sound advice. Who am I to argue. Local Democracy - Rewiring or Redesigning? This post is an accumulation of thoughts following a series of events over the last few weeks. As often happens in life things seem to come together all at once to disrupt the status quo and in particular challenge your own thinking. This has certainly been the case for me in the context of local government, and in particular local democracy - now and in the future. It all began when I attended the National Local Government Network (NLGN) Conference in February with my LocalGov Digital hat on. Whilst the venue was the Magic Circle (an incredible place by the way) if the contributions of the main political parties are anything to go by I feel there will be little by way of magic for local government in the years ahead. All major parties were present but I was left feeling somewhat underwhelmed by them all. For me the general sub text was that the challenging times will continue and that whilst there is often talk of devolution of power, a different relationship etc it seems to boil down to the simple truth that local government is not a vote winner for the major parties. The panel in the afternoon all agreed on that. Despite this I left the conference on a high. This was because, for the first time in a while, I got a sense of determination and energy from the sector. The audience spoke of redesign, transformation, systems thinking, collaboration, innovation. Out of context these can be empty words but I got a distinct sense that local government is "up for" the challenges it faces and is prepared to meet them in a different way. Ideally this will be with the support of government, but if not it will still happen. This was most evident to me in the closing piece by Simon Parker from the NLGN whose organisation clearly has a significant role to play in supporting the sector in ensuring that they are not empty words. Really good stuff. All of this bodes well for what we are trying to do with and across the local government family with LocalGov Digital. If evidence is needed of events coming together then look no further than the NLGN Publication - Smart People Smart Places - which was issued a few weeks later. If more evidence were needed, it makes the growing case for digital as an enabler and acknowledges the role LocalGov Digital has in making this happen. Fast forward four weeks. The setting is Edinburgh where the Commission on Strengthening Local Democracy is hosting a Roundtable discussion. The theme is Digital Democracy. I have been invited to attend, once again, with my LocalGov Digital hat on. Representing the collective efforts of some great people is in itself an honour. With this in mind, a big shout out to Dave McKenna - @Localopolis - with whom I co-lead the Rewiring Local Democracy work stream. Before I go any further I have to congratulate the Commission on their work. What they are doing is intrinsically a great thing. They are coming from the starting point that democracy is valuable, something that we should cherish, nurture and develop. It is our unique selling point, a feature which sets us apart. I applaud the Commission for having the bravery to both recognise this and do something about it. Can we have one please? The discussion that took place was insightful, challenging, sometimes robust, enlightening and thought provoking. You can view it in glorious techni-colour here so I wont go into the detail. The areas that really nudged my own thinking were the challenges generally faced by representative local democracy in the context of a less paternalistic model of local government and the "system" of local democracy in a 21st century / digital age. Is rewiring local democracy the golden bullet, the panacea that will re-engage local citizens with the voting system, stimulate active citizens, transform accountable decision making? OR, as Dominic Campbell of FutureGov says, is it about redesigning the system of democracy, starting again with digital as one (of many) enablers. It has to be more than bolting digital onto existing systems. When Dominic described the democratic part of local government as the most important but the most impenetrable it did shake my thinking on a number of levels. Is this the case? If so,why? I don't have all the answers, but as a believer, supporter and active officer who operates in that part of local government it is something I care about. The final chapter in this lengthy post came yesterday. The Steering Group met at the Government Digital Service offices. The experience alone was a massive eye opener. The culture, focus, leadership and working practices of the team are something to behold. There appears to be a genuine environment where systems and design thinking takes place in an agile way - "it's about show not tell", "change by doing, not by writing" (brilliant). I am sure that my Steering Group colleagues will share their insights separately. For me the clear message I took away was the need for Chief Executives and senior politicians across local government to understand and lead transformation. The GDS template is a powerful one from which they (and we) could learn. GDS clearly have high level leadership buy in, and the autonomy that allows them to deliver in a really effective way. So what does all this lot mean? 1. I think there is a real appetite for transformation across the sector. Necessity is the mother of invention etc but it feels like more than that. Perhaps its the hopeless romantic in me. 4. Harnessing the appetite in point (1) requires leadership and the bravery to do things differently. Political and officer leadership are essential in determining what happens next and how. I'd recommend a day trip to GDS for starters. As a digital democracy advocate, and a fully paid up member of the local government club, I personally welcome the widening out of the debate. The bedrock and heart of local government is its democratic mandate and democratic legitimacy. The challenges we face in local government, the lessons we are learning and the innovation that is taking place is relevant to the work of the Speaker’s Commission on Digital Democracy. That said, the real challenge, for the Commission and local councils, is to ensure the focus is on citizen engagement, participation and involvement in the breadth of democracy and the processes that underpin it. As @curiousc has said before it’s more than councillors (politicians) using Twitter. The Steering Group believe that local public services must be Open by Default -Digital by Design, relevant considerations for the Commission’s work. Officers and elected councillors have done some great work over recent years to test, challenge and embrace digital – the learning is relevant and transferrable. As Speaker Bercow says, it is important that the work of the Commission is “seen outside of Zone One of the London Underground Network”. Couldn’t agree more. It is for this reason that the Steering Group will proactively seek to inform the work of the Commission either directly or as part of public hearings and calls for evidence. Watch this space. This is a very personal post that just had to be written. It is intended for an audience of two. I have just returned form the LGA Conference where I have been doing more of the councillor / social media stuff which I've blogged about in the past. This post is not about that. This post is about two gents who I have had the good fortune to work with over the last three years. Thanks to Ken Eastwood having the foresight to put a councillor / social media session on at LocalGov Camp Yorkshire and the Humber I met Councillors Tim Cheetham and Simon Cooke. Since then we have worked together across the region trying to raise the profile and discussion around all things democratic and social media. They have both visited the Council I work for to help me spread the word. Our work together has been captured and shared here. Here's my take on Simon and Tim. Ideologically they probably couldn't be much further apart, but they have quite a few things in common. They are passionate about being a councillor, they genuinely believe in representing their communities and making a difference. They want to be representatives in a digital age and they want to support their colleagues on that journey. They are very funny and have a unique sort of chemistry. All this I have observed. For reasons which aren't really material to this post I think today may be the last time that all three of us will collaborate. 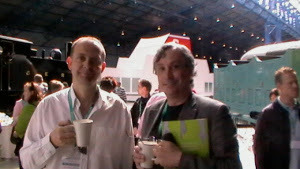 As Simon tweeted as we chatted over lunch - it had a bit of an end of an era feeling. If that's the case perhaps it's fitting we ended on the national stage at the LGA Conference. As an officer it goes with my territory that relationships with councillors remain professional, neutral and independent. I think I kept my part of the bargain over the last three years. That said I think I can also say that we worked well together and genuinely got on - this is a good thing and something I look back on with great pride. So this is my chance to say thanks, it was a real blast.